What it’s about: Motion pictures date back to the 1890s, when the Lumière brothers debuted the first movie projector. But the same decade brought a competing technology, which, instead of projecting a moving image onto a screen, gave a private showing for the viewer’s eyes only. 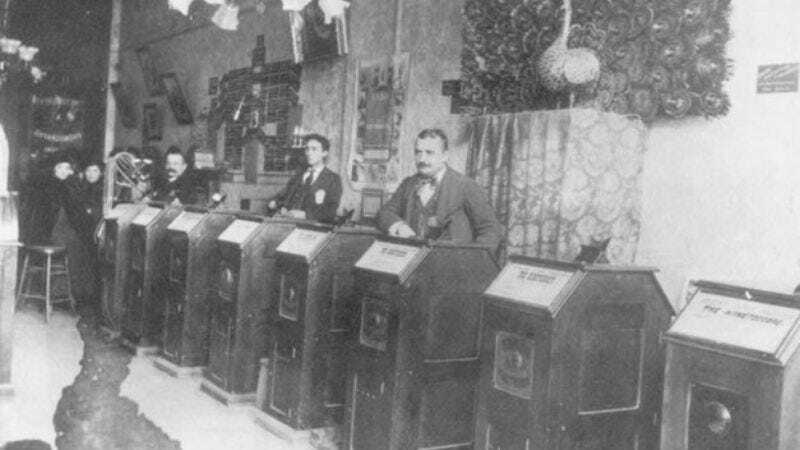 While the kinetoscope was the work of several inventors either collaborating or imitating, it was Thomas Edison who brought it to market, and constantly tried to improve the technology right up until nickelodeons (where you could watch a kinetoscope film for a princely 5 cents) were pushed aside for movie theaters. Strangest fact: While it wasn’t until 1927 that The Jazz Singer became the first full-length “talkie,” Edison began working on films with sound as soon as he began working on films. 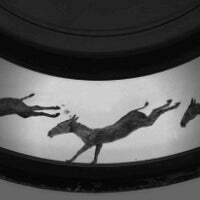 Another inventor, Eadweard Muybridge, demonstrated a zoopraxiscope, a device similar to a zoetrope, that simulated motion via a series of images painted onto a glass disc. Muybridge was convinced that his device could be somehow synced with Edison’s phonograph, to create a moving picture with sound, and proposed a collaboration. Edison declined the offer, but several months later filed a patent for a motion picture device, with no mention of Muybridge. Classic Edison. He assigned one of his most talented staffers, William Kennedy Dickson, to build a device that would display images and sound together. (Edison, naturally, took sole credit. Again, classic Edison.) Dickson and collaborator Charles Brown experimented with pinpoint photos (1/32-inch wide) viewed through “a microscope-like tube,” with little success (they entirely abandoned the idea of synching with sound), until they tried putting images on sheets of celluloid. While incredibly flammable, celluloid was both tough and flexible enough to withstand the rigors of being spun back and forth through their device. Finally, they were able to record Monkeyshines No. 1, the first film recording in the United States. The brief test film shows a blurry lab worker gesturing. Biggest controversy: Edison continued to lift ideas from wherever he could. After Monkeyshines, he visited Étienne-Jules Marey, who had built a motion picture camera that used a strip of flexible film. Edison added the innovation of holes along each edge of the strip, so the film could be moved smoothly and steadily by sprockets. From German inventor Ottamar Anschütz, Edison took the idea of using a flickering light—by having an intermittent light flash on each frame of film, the brain would fill in the gaps between each flash, creating a convincing simulation of motion. Edison was ready to begin screening for the public. More controversy followed. It wasn’t long before the kinetoscope was shocking audiences. Edison quickly moved on from short tests like Dickson Greeting and Blacksmith Scene to more crowd-pleasing subjects. He had built America’s first movie studio—a black box called the Black Maria—and invited two boxers to duke it out, while he shot an unprecedented 750 feet of film. Kinescope patrons had to pay a dime for each of the fight’s six rounds. They were a big enough success that Edison hired “Gentleman” Jim Corbett for the next series, to an exclusive arrangement—the first movie star contract. Another of Edison’s first films was a performance by Carmencita, a pre-vaudeville dancer who “communicated an intense sexuality.” When the film was shown in Asbury Park, the town’s founder and recently elected senator “was so shocked by the glimpse of Carmencita’s ankles and lace that he complained to [the] mayor.” The offending film was pulled and replaced with Boxing Cats (in case there was any doubt that GIFs had advanced even one iota in the past 130 years). Thing we were happiest to learn: For one glorious year, the kinetoscope was a sensation. People lined up to watch moving pictures in nickelodeons, despite the high price to pay for films that were generally about a minute long. Five minutes of entertainment would be $6 in modern money—that $12 ticket for Fate Of The Furious doesn’t look so bad by comparison. The first “commercial motion picture house” opened in New York in a small storefront in 1894, and was soon raking in $1,400 a month (over $33,000 in today’s money). Later the same year, the first foreign movie theater opened in London, and kinetoscopes flourished across Europe, in no small part because Edison never bothered to patent the system outside the U.S.
As far as Edison was concerned, it was simple supply and demand—if everyone could see movies projected on a screen, the novelty would be lost and the fad would be over. He paid for his shortsightedness figuratively and literally—the kinetoscope’s profits dropped by 95 percent in its second year, and Dickson—Edison’s uncredited collaborator—jumped ship to develop a film projector. In May 1895, Dicksons’ Eidoloscope screened the first commercial motion picture for an audience of more than one—a boxing match either four or eight minutes long. Edison worked on (or took credit for) several projection systems in subsequent years, but from then on, he was playing catchup. It took him until 1913 to realize his dream of syncing sound with pictures, but the new Projecting Kinetoscope’s audio quality was poor, it was hard to keep the movies synced for their full running time, and when a fire destroyed Edison’s image and sound masters the following year, he abandoned the project. Best link to elsewhere on Wikipedia: The story doesn’t end there, as Hollywood put out new models of film projector with nearly the same regularity it put out movies. List of film formats documents them all, from one-time household names like CinemaScope, Cinerama, and Super 8mm, to relatively obscure names like Fearless Super-Film (invented by Ralph Fear, no less), Giant Expanding Pictures, and Thrillarama. The list also ends with several formats with no creator or date known, so get on that, Wikipedia sleuths! Further down the Wormhole: The kinetoscope had more competition for the public’s entertainment nickel than just projected film. The year after it debuted, America’s first amusement park opened, just a few miles away from the first movie house. For the same price as five quick kinetoscope films, you could get three rides, a sea lion show, and a dancehall number at Coney Island. Next week we’ll look at Brooklyn’s iconic theme park, and how it both changed New York and survived countless swings of the wrecking ball to remain a cheap, quick vacation for New Yorkers from all walks of life.